Republished May 4, 2017, 4:30 p.m. to clarify that utility-scale solar plants make up 2% of electricity generating capacity, not 2% of utility-scale electricity generation. Utility-scale solar installations—including both photovoltaic (PV) and thermal technologies—grew at an average rate of 72% per year between 2010 and 2016, faster than any other generating technologies. Utility-scale solar (plants with a capacity of at least one megawatt) now makes up about 2% of all utility-scale electric generating capacity and 0.9% of utility-scale generation. The first utility-scale solar plants were installed in the mid-1980s, but more than half of the currently operating utility-scale solar capacity came online in the past two years. 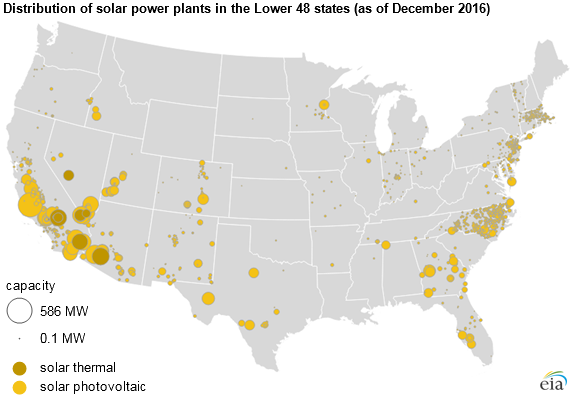 As of December 2016, more than 21.5 gigawatts (GW) of utility-scale solar generating capacity was in operation across the United States, with more than 7.6 GW of that capacity coming online in 2016. 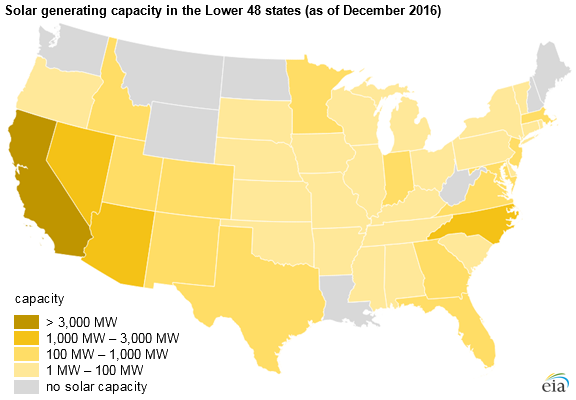 Although California has the highest total installed capacity of any state, a number of states have deployed significant utility-scale solar capacity in recent years. Several states have policies such as renewable portfolio standards or state renewable tax credits to encourage solar deployment. Since 2005, the federal government has provided a 30% investment tax credit, which is scheduled to phase down or expire by 2022. Utility-scale solar generation has been increasing as a result of the rapid growth in capacity; however, solar’s share of utility-scale electricity generation is 0.9%, about half of its share of capacity. Most solar generators are considered an intermittent or non-dispatchable resource because their availability depends on ambient insolation (exposure to the sun). Some systems, such as the Crescent Dunes solar thermal plant, are paired with an energy storage system, which allows greater operational flexibility. As monthly capacity factors indicate, solar generation is strongly seasonal, with more sunlight available in the summer (about 30% capacity factor on average) than in the winter months (near 15%). According to EIA estimates, California, New Jersey, and Massachusetts had the most small-scale solar capacity with 5.4 GW, 1.3 GW, and 1.0 GW, respectively. Monthly generation from small-scale solar capacity is estimated to have been 1.6 million megawatthours (MWh) on average in 2016, or about two-thirds of the amount generated by utility-scale solar generators. This article is part of a series of Today in Energy articles examining the fleet of utility-scale power plants in the United States. Other articles have examined hydroelectric, coal, natural gas, nuclear, wind, petroleum, and other generators.